Some people had waited twenty five years to see Pierre Bensusan; others had heard a great guitar master was in town, and strangely enough there were those who just happened to turn up to the local venue for a night out. Regardless what was the driving force of them being there, by the end of the night the audience was in awe and speechless after hearing one of the greatest acoustic guitar performances ever on Australian shores. Pierre Bensusan walked out on stage and bowed. He had an Acoustic Guitar made by Irish luthier George Lowden in one hand. It was tuned down to DADGAD tuning. Not a word was spoken; he sat hunched over his steel string, his head leaning towards the lower guitar bout, as if he was listening to the nuances of the instrument, he then headed into Le Voyage Pour L’Irlande, a song recorded on the album Musiques in 1979. At the fourth song in the set, Pierre ventured into a vocal improvisation, not unlike the great songwriter Milton Nascimento. As it developed, he added a Brazilian style of accompaniment, the vocal had already mesmerized the audience and the rhythm almost lifted the roof off the building. 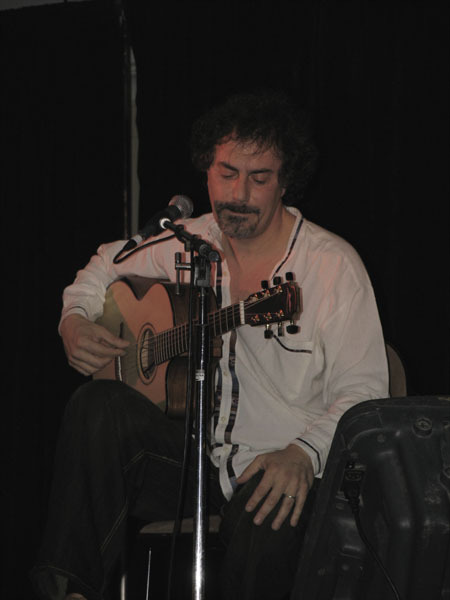 Throughout the show he performed a number of tunes from his most recent album Altiplanos, one being a tune where he sang a poem by Victor Hugo. He also did another very sensitive tune called Hymn 11 off the same album. Amongst a night full of highlights, an outstanding song was the one in dedication to guitar great Michael Hedges, called So Long Michael. He also did another song from the Intuite album called Silent Passenger and some older songs were given new life, such as Nice Feeling off the Solilai album, Agadiraman off Spices and other tunes which long term fans recognize as classics. Pierre’s has the unique ability to draw a range of tones out of the steel string guitar which generally are inconsistent with what emerges from that type of instrument, the tones we were hearing are more common to the nylon string guitar. In the song Intuite, dedicated to Mounir Bachir, it sounded like the Persian instrument the oud. This sound was achieved by using advanced harmonic techniques and tapping on the upper area of the fretboard on the lower strings. How he can achieve a nylon string and an oud sound from a steel string guitar can only be a combination of some sort of hidden pact between George Lowden and Pierre that the world does not yet know about. With the sensitivity of Ralph Towner, the inventiveness of Micheal Hedges, the complexity of Egberto Gismonti and the confidence of Paco de Lucia, Pierre Bensusan is beyond a doubt the guitar player’s guitar player and is truly one of the greatest innovators of the steel string guitar of our time. As one of the audience who waited twenty five years, I must say, it was worth waiting, and I’ll wait another twenty five if need be. A great review for the concert. I look forward to see him someday, sometime…. Thanks for the beautiful and well written description. Never heard of him before,will check him out. Pierre Bensusan is my hero! I have no doubt that he is a marvelous player but why haven’t I heard of him before? Thanks for the review. Raymond, There are so many great players now. It’easy to miss a great one.